Our MOST moisturizing body cream – 72 hours of moisture. In Brazil, we give our bodies the same love and attention as face – if not more. Like a deep Brazilian pool of absolute body love, this oil-in-water cream hydrates deeply with our moisture-attracting CocoSugar Blend of luscious coconut and sugar, and scents deliciously with our mouthwatering Cheirosa ’39 fragrance and notes of toasted coconut, creamy caramel, and buttery praline. This coco-amazing cream instantly transforms dry, dehydrated, irritated skin into its softest, bounciest, most luscious version of itself. And benefits only get better and better with continued pampering and body love. This all-over cream is enriched with our CocoSugar blend of nourishing coconut oil and fermented sugar – together they form a skin-transforming moisture magnet that draws, holds and hugs moisture close - up to 72 hours. Because our sugar is fermented, this natural humectant becomes even more concentrated and more powerful as it draws moisture from the air. A light, luscious texture glides on and kisses the body with plush, pampering oils that melt into skin and linger for soft, dewy, touchable skin. Benefits are heightened with our Brazilian Beauty Blend of antioxidant-rich açaí and nourishing cupuaçu butter. This unbelievably delicious body cream treats, pampers and replenishes dry skin, embracing the body with deepest hydration for healthier, happy skin. Surging with a whole new level of body love, our Coco Cabana Cream may take a few minutes to sink in but it’s sooo good, and so worth the wait. As our most moisturizing body cream, Coco Cabana Cream pampers and helps to protect against the elements, as well as all seasons and conditions, including: wind, heat, cold, and post-sun, too. Comforting and clinically proven to soothe irritated skin, and redness, too. Use it for at least three days for serious body love and the deepest benefits. Continued use promises the most dramatic rewards. In addition to deep skin-loving benefits, our Coco Cabana Cream leaves skin scented with our Cheirosa ’39 fragrance and mouthwatering notes of coconut, toasted praline and warm vanilla latte. A total temptation for the senses. Nobody does body like in Brazil. Our Coco Cabana Cream is made with delicious gourmand fragrance notes that love to mingle. As they do, a slight color change may take place over time. Like all gourmand fragrances, color and scent may deepen and we wouldn’t dream of using additives that alter this experience. This is body love at its fullest. Nourishing coconut oil and fermented sugar form our CocoSugar Moisture Magnet that delivers up to 72 hours of skin-hugging moisture. Fermented Sugar: A natural humectant, açúcar draws moisture from the air and when applied to skin our bodies just drink it in. Our sugar is fermented – which means it’s purified for deeper concentration and richer in body-loving nutrients. Cupuaçu Butter: The Amazon’s answer to Shea Butter is chock full of fatty-acids, Phytosterols, and Polyphenols. These powerful ingredients help to lock in moisture and restore skin’s elasticity. Açaí: This antioxidant super-fruit powerhouse helps keep skin looking and feeling healthy and young. 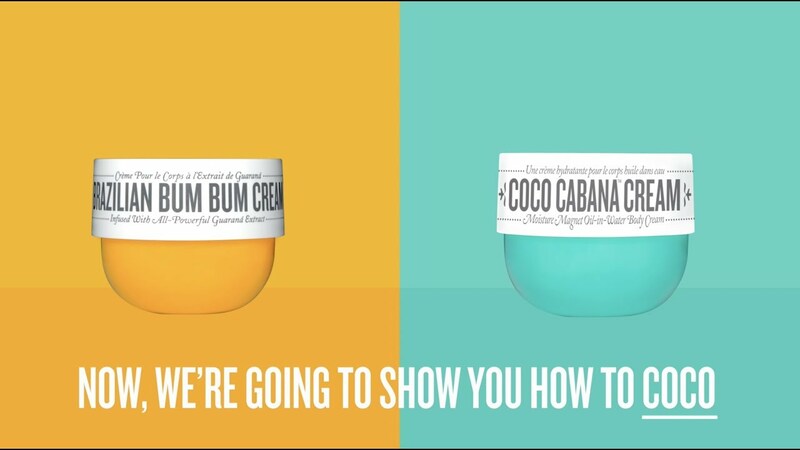 Because of the deep lusciousness of our cream and our deep down moisture benefits, allow a few seconds for Coca Cabana goodness to sink in. You can’t rush the love. At this time we can only ship to addresses in the USA and US territories. (International shipping coming soon!) Contact us at ola@soldejaneiro.com to locate an international authorized retailer of Sol de Janeiro products so that you can get our Brazilian Beauty Secrets worldwide. Orders are processed and shipped Monday-Friday, excluding federal holidays. Please allow 1-2 business days for order processing. Once you've placed an order with us, you will receive a confirmation email containing your order number. You will also receive a second email containing your tracking information once your order ships. All orders are shipped via FedEx or FedEx SmartPost services accordingly. Free standard shipping is available for orders of $50 or more, sent to addresses within the USA and US Territories. Additional processing, shipping time, and restrictions may apply for some products and locations. Please allow an extra 7-10 business days for orders shipped to Hawaii and Alaska. For shipments to APO/FPO addresses, Puerto Rico, Guam, US Virgin Islands, and all other US Territories, please allow an additional 2-4 weeks for delivery. Yes, we do ship to PO boxes within the United States! Please be sure to select "Standard (3-7 business days)" or "Free Shipping" during checkout. Orders containing our Brazilian Crush Body Fragrance Mist may experience an additional shipping delay as per federal regulations regarding hazmat substances. If ever you are concerned about the status of your order, please email ola@soldejaneiro.com for more information. While we do not require a signature to receive the shipment, we highly recommend that you be present to accept delivery given the high value of your order. We realize this may be inconvenient but we would like to ensure that your purchases arrive securely. Our products need to be stored in a cool dry place, and we don’t recommend leaving them outside on your doorstep. We're sorry you didn't love our Brazilian beauty goodies! Email us at ola@soldejaneiro.com with your order number and we will happily come up with a solution for you. We will accept full and partial returns within 30 days of purchase for a refund if you are not completely satisfied with our products. We will accept returns containing at least 50% of the product and in their original product packaging only. Please note that all customers are responsible for all shipping and handling fees incurred for products sent back to Sol de Janeiro. Once we have initiated your return process via email at ola@soldejaneiro.com, we will provide you with our return address. Once the return is received and inspected, the refund is processed securely ia PayPal back to the original method of payment and may take up to 7-10 business days to complete. Please note that we can only accept returns for products purchased through our website (https://soldejaneiro.com). Products purchased through an authorized retailer must be returned to the original place of purchase, in accordance with the retailer’s return policy. In addition to deep skin-loving benefits, our Coco Cabana Cream leaves skin scented with our Cheirosa ’39 fragrance and mouth-watering notes of toasted coconut, creamy caramel, and buttery praline. A total temptation for the senses. Nobody does body like in Brazil. Contact us at ola@soldejaneiro.com to locate an international authorized retailer of Sol de Janeiro products so that you can get our Brazilian Beauty Secrets worldwide.